She's So Fine, My 2351cc! 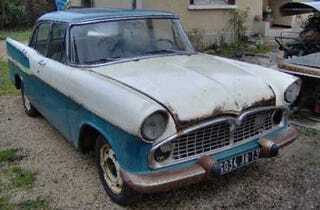 Simca Chambord Alert! I've forgotten my dream of owning a Harlequin Trabant with air horns, because I have found something even better Over There, in the land where our heroic doughboys braved mustard gas and Minenwerfers to fight the Kaiser: a 1959 Simca Chambord. The evolution of the Vedette R gence, the body of the '59 Chambord showed the influence of its Chrysler cousins; best of all, it sported a 2.4 liter V8 under the hood. That's no typo, folks- a 2.4 liter V8! Imagine what that thing would sound like with Cherry Bombs! Current bid price is only 1,580 Euros.